Some time previous to Dr. Hawkesworth's publication of his beautiful little Ode On Life, (since published in Pearch's Collection of poems, in four volumes), he carried it down with him to a friend's house in the country to retouch. Dr. Johnson was of this party; and as Hawkesworth and the Doctor lived upon the most intimate terms, the former read it to him for his opinion, "Why, Sir," says Johnson, "I can't well deter- mine on a first hearing, read it again, second thoughts are best." Dr. Hawkesworth complied, after which Dr. Johnson read it himself, approved of it very highly, and returned it. Next morning at breakfast, the subject of the poem being renewed, Dr. Johnson, after again expressing his approbation of it, said he had but one objection to make to it, which was, that he doubted its originality. 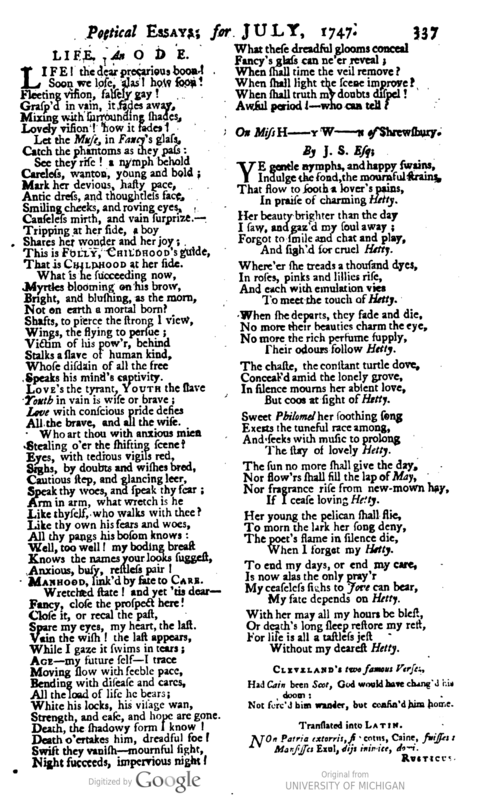 Hawkesworth, alarmed at this, challenged him to the proof; when the Doctor repeated the whole of the poem, with only the omission of a very few lines; "What do you think now, Hawkey," says the Doctor? "only this," replied the other, "that I shall never repeat any thing I write before you again, for you have a memory that would convict any author of plagiarism in any court of literature in the world."